- Fashion Ecstasy on 十月 10, 2018. 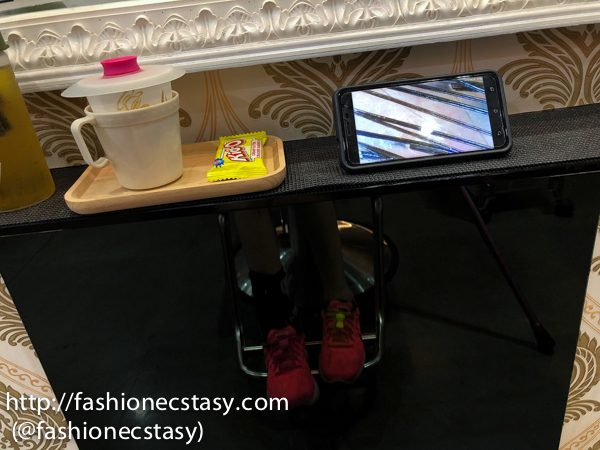 Tainan‘s Angel Feathers Hair Salon is 1 of Tainan’s Top 5 English Friendly Stores and a hair salon that makes you feel pretty from inside-out! The last time I’ve felt so good leaving a hair salon was my collaboration with world renown beauty brand Schwartzkopf. To say that I’m overwhelmed by the services and professionalism provided here at Angels Feathers is an understatement. 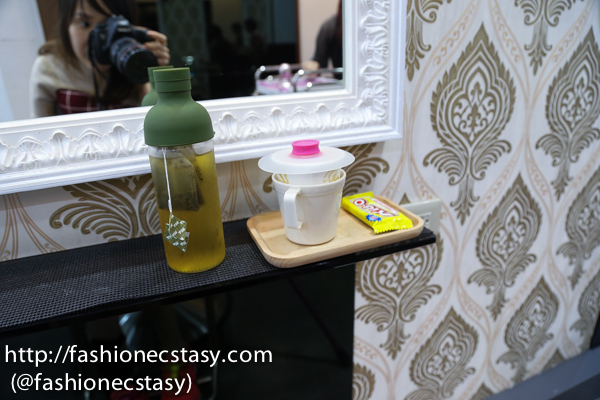 Hair extensions have become very popular in recent years, especially in Taiwan. However, did you know the history of hair extensions dates back to 3,500 years ago from ancient Egypt? This is something I learned from Angels Feathers owner, Jie Cai. Cai is very knowledgeable and professional; I learned a lot about hair from him. Generally, there’s a lack of respect for professionalism Taiwan, hence to find someone who’ s so professional isn’t easy. There is a designated parking lot next to Angel Feathers Hair Salon; customers can park for free. After welcoming us in English, refreshments are served. In addition to coffee/tea/water, guests also receive a pack of Kid-O crackers when seated. 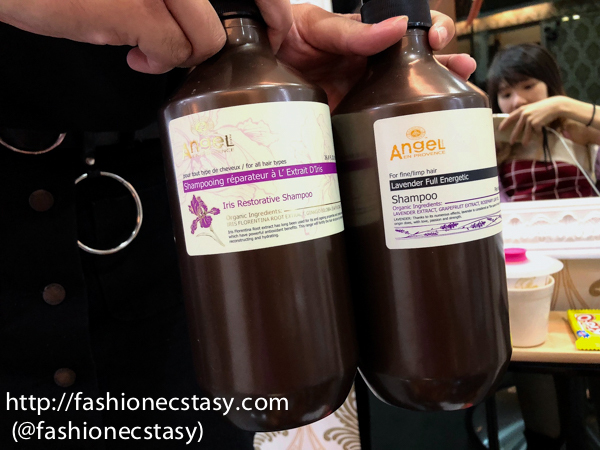 My shampoos include the “Lavender” for scalp soothing and the “Iris” for hair repairing. During hair wash, the stylist massages your scalp with a pointed spa comb then with her fingers. After using both shampoos, she gives me a quick hair conditioning treatment in water. “Water treatment is faster than steam,” she said. After hair wash, owner Cai attends to me himself for my hair extension. He reveals that he is the inventor of “Shimmer Hair Extension Skill,” a patented technique used at Angel Feathers Hair Salon. 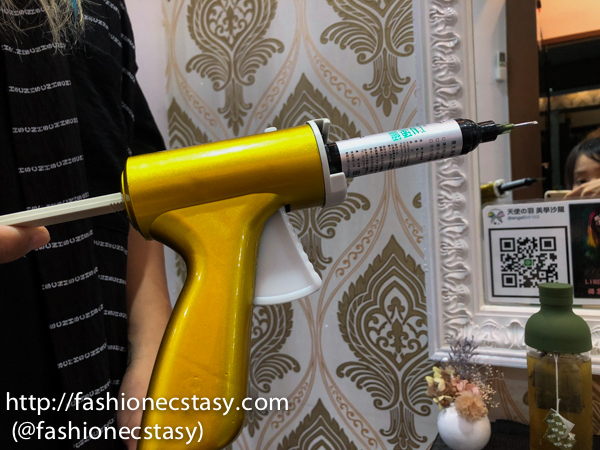 For different clients, Cai created 10 different customized Shimmer Hair Extension Skills.” He also lectures internationally and has over 10,000 students from Taiwan, Malaysia, Vietnam, China, etc. Thanks to Angel Feathers, my crazy color is captured. The professional photo shoot studio upstairs is where customers can capture their beautiful moments after a makeover. Angel Feathers’ “Korean style headshot” adds a playful twist to your passports and IDs.